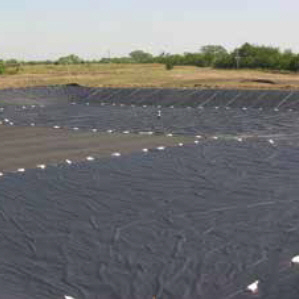 GEOSKRIM® NQ45BX1 is a highly flexible single-side textured geomembrane, reinforced with a closely knit 9x9 weft inserted polyester scrim fully encapsulated between two layers of highly UV stabilized polypropylene. Exceptional flexibility is achieved by incorporating high levels of ethylene propylene rubber into polypropylene along with a dense scrim reinforcement, resulting in excellent dimensional stability and physical properties. GEOSKRIM® NQ45BX1 does not contain plasticizers that can leach out and hinder long-term flexibility and performance. GEOSKRIM® NQ45BX1 contains SurGrip™ cast extrusion texture. TheSurGrip™ textured surface consists of a diagonal cross hatch pattern with uniformly raised self-draining treads. GEOSKRIM® NQ45BX1 provides outstanding resistance to environmental stress cracking, even in elevated temperatures and chemical environments. NQT Series geomembranes are produced in the color black as standard, and is available in other custom manufactured colors with minimum order quantity requirements. Click here for Product Data Sheet.